As your business grows, you’ll want to add new agents to work on incoming conversations. Agents are team members that provide support services – they take care of customer requests, answer chats, emails and manage all social media and other messages. With the admin role, they can also supervise and configure the system. Step 1: After logging in to your Paldesk account as an Administrator, you can add a new agent in your dashboard under the ‘Administration’ tab > ‘Settings’ > ‘Agents’. Step 2: To add a new agent click on the ‘+’ button in the upper right corner. Step 3: Enter new agents e-mail address and choose his/her role in your team (Agent or Administrator). The difference between the Agent and Administrator role is that an Agent can’t see or access the ‘Administration‘ tab at all. Each Administrator has the same rights as the original Administrator who invited them. Step 4: New Agents will receive an email invitation that will direct them to the registration page. Step 5: After the registration, the Agent will receive an activation email confirming and verifying their email address (standard new user registration flow). If the Agent is already registered on Paldesk, they can bypass Step 5 by clicking ‘Already have a Paldesk account’ and simply log in with their existing account! That’s it! The Agent is now an active member of your team! Step 1: Click on ‘Administration‘ tab and under ‘Settings’ choose ‘Groups‘. Step 2: Under the ‘Select Agents’ section press ‘Add agent’. 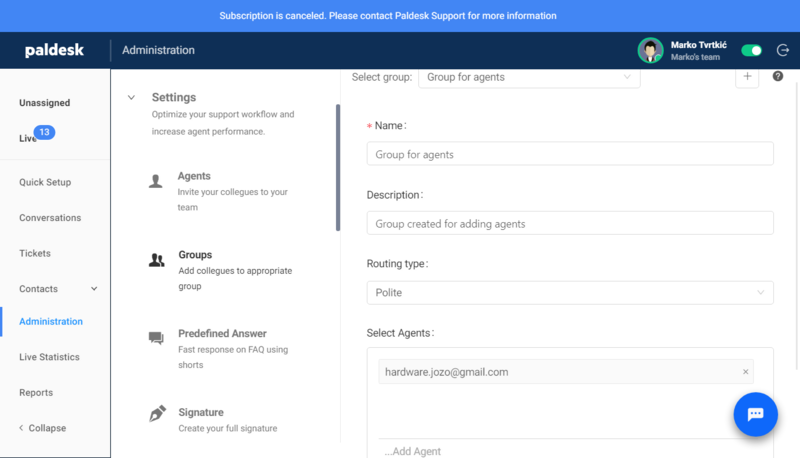 Step 3: Choose which agents you want to add or remove from your group . Step 4: Click on ‘Save’ underneath it to confirm you choice when you are finished. Once you are in Groups settings, you can see that there are 3 options you can choose from Polite, Dictator or Democracy. Polite routing type is default routing type once you created your account. 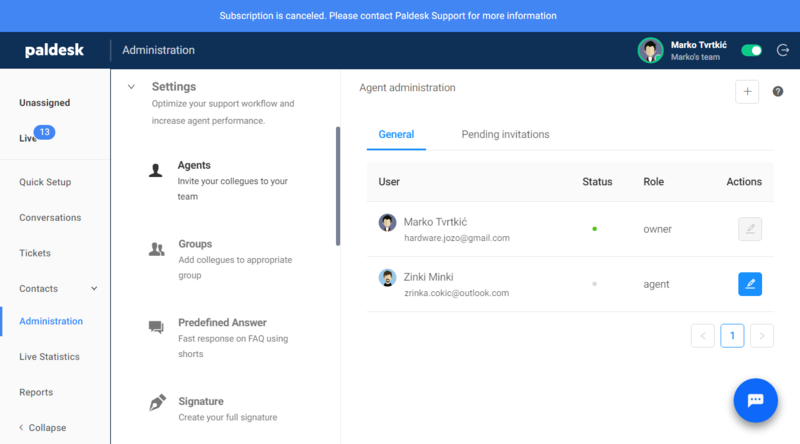 It works behind the idea that Paldesk system offers a client with a pop-up window and asks an agent if he or she with options to “Accept”, “Reject” and “Accept and Open”. If an agent rejects a live conversation with a client, that client will be offered to other agents until someone accepts it. Dictator routing type is a routing type that is contrary to Polite routing type. While Polite routing type asks an agent if he wants to accept or reject a live conversation, Dictator routing type will automatically assign a live conversation to an agent. The system will choose an agent with the least amount of live conversations and assign the new one to that agent. Democracy routing type is a routing type that all incoming live conversations go to the unassigned list of conversations. Then, agents themselves manually select which conversation they want to take over.